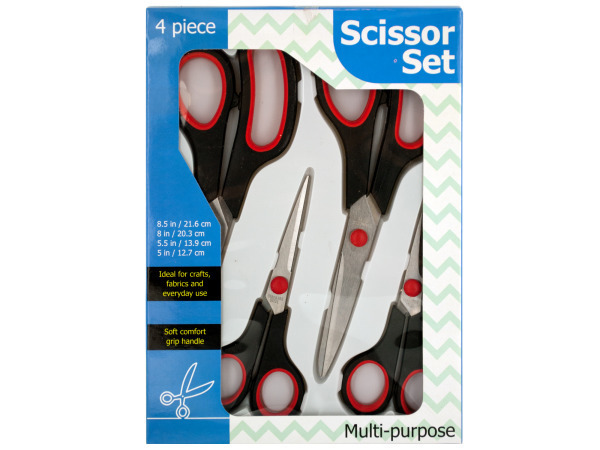 Ideal for crafts, fabrics and everyday use, this 4-piece Multi-Purpose Scissor Set features an assortment of scissors with stainless steel blades and soft, comfort grip handles. Great for cutting cardboard, tape, light rope, fabric, film, paper and many other home and office materials. 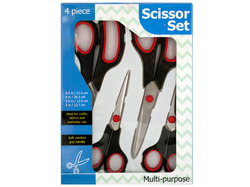 Set includes: 8.5", 8", 5.5" and 5" scissors. Comes packaged in an individual window box. Box measures approximately 7" x 0.75" x 9.625".